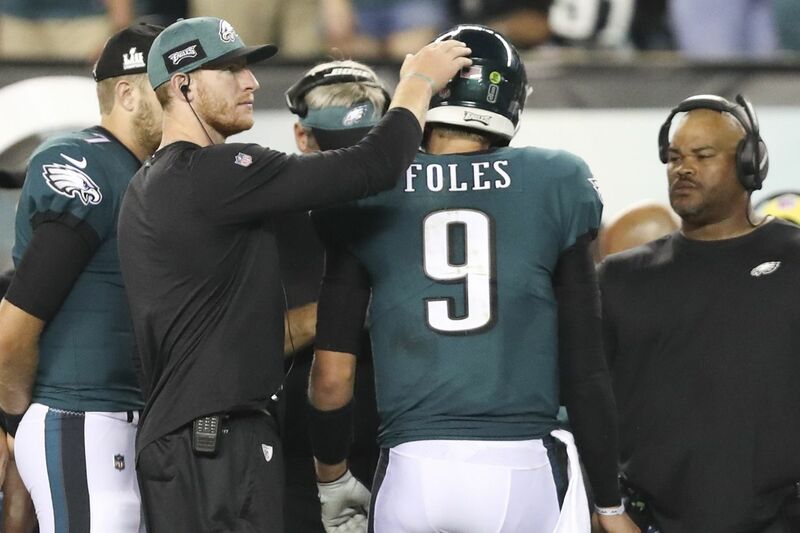 Carson Wentz encourages Nick Foles during Thursday's Eagles opener against the Falcons. Lane Johnson, the Eagles' executive vice president for football truth, called Thursday's opener "a sloppy, greasy win," and that was the best description to be found after the defending Super Bowl champions managed to barely slip past the Atlanta Falcons. They emerged from beneath the chassis of the smoking mess covered in oil and blood, but the engine was running once again, and, pretty or not, the Eagles are still cruising on a winning streak that began against the same Falcons eight months ago. "We'll take all of these we can get," Johnson said. They shouldn't press their luck. Football does not continue to reward teams that cut the corners this closely. If the Super Bowl itself was a night of the blue snow, a once-in-a-generation melding of character, skill, and courage, then Thursday was merely a rain-delayed slog through a swamp of penalty flags on an evening in which nothing was as sharp as the nearby lightning strikes that heralded the start of the new season. "Not as crisp as usual," the executive vice president said. No, about as crisp as a ripe banana. But, as noted, a victory, and a victory for a team that was widely expected to trip on its regal robe in the first game. The reasons were many: Too many injuries, too many roster changes, too much Super Bowl hangover, too much Nick Foles. There were plenty of theories as to what would derail them, but none held up, largely because the Falcons couldn't overcome either the Eagles defense or their own coaching staff. The big reveal of the evening, if an unsurprising one, is that Foles did not, in fact, barter his immortal soul to the devil in exchange for becoming a franchise-quality quarterback, which was one of the few plausible explanations for what happened in Minneapolis in February. Against Atlanta, Foles was mediocre at best. He was inaccurate for much of the game, didn't have a whole lot of zip on the ball, and Doug Pederson padded the edges of the offense to limit the damage he might do. Not only can't Foles take the top off a defense, he also can't even loosen the cap. The Falcons' Matt Ryan — who also stunk, by the way — at least had five completions for 20 yards or more. Foles had zero. Some of that was because of Atlanta's bend-don't-break zone philosophy, and taking what the defense offered, but if that's the easy formula to deflating the Eagles offense under Foles, it won't be the last time they see it. As usual, Foles was phlegmatic about his performance, which is the case on both good days and bad. "I mean, it's never fun," Foles said of his struggles to find a rhythm. "This game is not easy. Winning in the NFL is not easy." It isn't when you have a quarterback rating of 50.7, that's for sure. Can the Eagles continue to win with Foles? Well, unless the entire Philadelphia area has been huffing psychotropic substances for the last year, they did win a Super Bowl with him. He had a rating of better than 100 in all three of the postseason games. So, sure, they can win when he plays well. And, apparently, they can win when he doesn't. The question is for how long. Ian Rapoport, of the NFL Network, who initially broke the story that Foles would start in place of still-healing Carson Wentz, put another log on the fire before Thursday's game when he reported that Wentz would miss "several" more starts. Webster's defines that as "more than two, but not many," but Webster is largely unaware of the caution required for recovery from significant knee surgery. Here's my definition of "several" games: Until they lose. Once again, Pederson seemed irritated that the team's internal medical decisions had become available programming for the league's house organ, but there doesn't seem to be much he can do to stop it. "I'm going to investigate that a little bit more and see where and why and when that came out," Pederson said. Good luck with that. And good luck with extending the four-game winning streak with a guy who has as many bad games as good. In Foles' 40 career starts, he has a quarterback rating of less than 80 in 17 games, and more than 90 in 16 games. There are only seven lonely games in that acceptable middle ground of 80-90. Nick Foles is 29 years old and he's in his seventh NFL season. This is who he is. Who the Eagles are this season is still to be determined. They didn't buy a lot of new believers Thursday night, but they did buy some time. Winning provides patience, which would be in short supply after a sloppy, greasy loss with the redheaded kid on the sideline.